brings them together when Yan Zi saves Yu Hao. Edited by Tiffiany_45, 04 April 2009 - 04:15 AM. Blue is the guy that plays the quiet one in fightingfish.... he is also barbie hsu's BF (real life) and he played in MG as well... he was DMS's cousin remember? Edited by Chinesebabygurl, 01 February 2004 - 11:49 PM. Does anyone know how many episodes this series have in all? I love the song Lydia!!! I started liking it..when i first heard the song!! i know, this series is so good with such a sad ending...... i really love all the song they play in this series, especially the english one. anyone know whats the title of it and who sings it...... THANKS! when i first heard about the series..
but by the time i watched it..
the story is soo cool..
yes i like f.i.r. 's lydia!! Edited by ladysnowy7355, 19 June 2004 - 03:36 AM. does anyone have pix of Iron and Ady??? can you please post some, Thanks!!! Male, 19 years old, lonely and arrogant personality but toward his buddies, he is extremely loyal. He, who seems to be cold and ruthless, has deep feelings towards Yu Yan. Even though the buddies by his side and the gang's leader advises him not to take her along by his side and mess things up, yet Hao won't listen. For this, he even goes so far as gets into conflicts with Li Jie time and again. Female, 17 years old, second year student at Ying Da High School. Elegant and delicate appearance and because her name has the character "Yan", therefore, the students give her the nickname of Xiao Yan Zi or Small Swallow. Yu Yan has always grown up in a pure and simple environment. She is innocent and naÃ¯ve toward the affairs of the world. Yet all of this changes when she accidentally meets up Yu Hao. She regards love as the way of kindling life. Male, 19 years old, adoptive son of Geng Ji Xiong. Intelligent and cool-headed personality, a character who acts the image of a military expert. For the matter on Yu Yan, he urges Yu Hao time and again. When Yu Hao gets bullied and ruined a big event because of Yu Yan, causing one of their buddies to be snatched away by the slip of a piece of paper, Dan Zi couldn't stand it any longer and separated with Yu Hao, saying that they will no longer be acquainted with one another. But when Yan Zi left because of him and got trampled on when she didn't have any protection, Dan Zi returned again. Female, about 17 years old, second year student at Ying Da High School, vicious personality. At first, because she was jealous of Yu Hao liking Yan Zi, she was always bringing trouble for Yan Zi. But after Yan Zi gets together Yu Hao and the two of them started getting familiar with each other, Hong Dou lost interested in everything and with her personality of speaking whatever is in her mind, she gradually became familiar with Yan Zi and the two of them becomes good friends. Male, 19 years old, has been good buddies with Yu Hao and Li Jie since young. After growing up, he also follows the other two around. With regards to Hao, he obeys him to the extreme. Rash and frank personality. Thinks himself as carefree and unrestrained, he constantly changes girlfriends to show the difference of style between him and his buddies. Later he becomes a couple with Hong Dou and the two of them are always fighting around all day long. Female. When Yu Hao meets her, she was just the age of Yu Yan -- a 17 year old who would make a person's heart move impulsively. Because her father sinks into gambling and owing money to Zhuang Ju Kuan, Xiao Die was forced to work at a hotel. But on the first day that she arrives at the hotel, she meets with Yu Hao. Xiao Die's neat and elegant appearance seems extremely like Yu Yan and caused Yu Hao to step in and save her. From then on, Xiao Die has been totally bewildered and enchanted by Yu Hao. "Fighting Fish" has a strong cast, including Guo Pin Chao, Lan Zheng Long, An Yi Xuan, Lu Ming Jun. And the show's bad guy, "Lao Shu", is played by Ah Pang, who has played the generous and upright characters in idol dramas all along. The whole story describes a group of best buddies that grew up in a village that mixed together since they were young and continued on until they grew up to be the leader of a gang. And Guo Pin Chao's character, because of falling in love with the standard criteria of a social class, obedient girl (played by An Yi Xuan), he struggles between the mafia and love. The drama of "Fighting Fish" is full of real emotional, hot-blooded characters. There will also be a lot of fighting and racing car scenes. Moreover, it will have a satisfying ending that is different than the ordinary idol dramas. Fans of idol dramas would really have something to look forward to. An Yi Xuan and Guo Pin Chao, who has to play the part of a couple in a bitter love, with regards to acting in an idol drama that is in the background of the mafia, they are both nervous and excited. Especially Guo Pin Chao, because this type of performance is totally different than his acting experience from the past. Moreover, this is his own main role. Guo Pin Chao has very seriously watched all the Hong Kong movies that portrays "gangsters". In addition, he took the initiative to request the company to allow him to take some acting classes. People in the company recommended that he pay attention on the part of expressing emotions through the eyes. An Yi Xuan expresses that she feels a lot of pressure when acting together with Lan Zheng Long, who has lots of acting experience. In the drama, An Yi Xuan has to act out the part of an obedient girl who loves to play the piano. Until the day that she meets up with Guo Pin Chao, the power of love actually causes her to decide to elope. Later she slowly changes to the personality of a tough â€œbig sister.â€� From beginning to the end, her personality changes enormously and it is a big challenge. As for Lan Zheng Long, who has been constantly filming recently, working on an idol drama at his girlfriend, Da S's GTV, believe that his girlfriend would definitely energetically publicize the drama on her own directed show "Yu Le Bai Fen Bai." In "Fighting Fish", Lan Zheng Long plays the character of the military expert that is by Guo Pin Chao's side. He does things with a cool head and doesn't speak much until it reaches the most important moment which is in accordance with his own private image. Liu Ming Jun, who started out as a model, this is her second drama after her part in The Rose and her performance is awaited by all. In "Fighting Fish", Liu Ming Jun would be playing the part of a frank, gangster girl. Her personality is ruthless like Karen Mok's role in the movie, Young and Dangerous. The bad guy who is played by Ah Pang was directly recruited by the director of "Fighting Fish", Ke Qin Jing. Because Director Ke saw Ah Pang's other performances, he really admires him and for this reason, he appointed Ah Pang to play the role of the bad guy. Ah Pang says that being able to get away from his usual image and act the part of a bad guy, he is also very excited. The whole drama with the original cast of "Ma La Xian Shi", Du Man Ni Production Company and GTV Company, signed a contract to film. It is believed that this will surely be able to grab the "appetite" of the young spectators. Edited by Pink89BeBe, 25 June 2004 - 12:40 AM. i love the design of the tattoo that ady got for ah hao. what a sad ending. i couldn't stop crying when ah hao died. 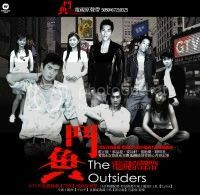 Does anyone have a script of this series (The Outsiders)? My friend's CRAZY about this and I wanted to help her find the script. She already has the orig soundtrack that she bought from YesAsia and the whole tv series is already available at Mei-Ah in Ongpin unfortunately, no Eng sub. It's already being shown locally in Manila at Channel 5, 5pm everyday. If you have any idea where I can find the script please let me know at mmym25@hotmail.com. Edited by mmym25, 22 July 2004 - 04:18 AM. What the title of the theme song? Edited by tammiest, 09 December 2007 - 07:12 PM. What the title of the theme song? If possible can you guys give me a link where i can actually ahem.. *cough* download *cough* it? the theme song is 'lydia' sung by F.I.R. by the way just want to ask why was Blue imprisoned? Why did Ah hao died at the end of the series? By the who is the other guy who died? is he the other friend of Blue And Ah Hao in The Outsiders? Whats the story of the Outsiders 2? - because he was killed? Nah.. simply because he was set up by the Mouse and his big bro at the pier/jetty. He was supposed to sent a Mainland girl back to her home country without noticing that Mouse and compatriots were expecting him. The leader of the triad was also involved in the dirty scam as he viewed Ah Hao as a competitor to his reign as big boss. thanks a lot for the info... im just curious because the outsiders had just started... wat happened to Ady at the end of the series? by the way, is it true that Guo Pin Chao changed his englisah name from Irons Kwok to Dylan Kuo? Is it also true that his album will be released on Aug. 6? i'm watching this right now and it's really interesting!!!!!!!!!!!! that girl, An Yi Xuan, surely changes so quick .. she just all of a sudden becomes a gangster girl!! well, i haven't finished this yet .. but it's like the love between An Yi Xuan & Guo Pin Chao is just fading slowly and slowly .. that's just really sad .. as for Guo Pin Chao, i dont think he's a very understanding person at all .. he needs to learn to think before he does anything ..
i thought them 3 best friends joining the gangster was a big mistake!! they could've just go to the police or maybe leave the country .. or something .. joining the gang just ruin the whole life and affected others greatly!! well, everyone did a really wonderful job playing their roles .. the 3rd guy of the 3 best friends who isn't very smart .. well, that guy, i dont think he did a very good job, but he was alright ..
can anyone please give me the site of this serie?? you know, the serie's site .. i had the site, but i lost it =[ so please help me out! wat happened to Ady at the end of the series? Ady is pregnant with Ah Hao's son. She eventually worked as a kindergarden teacher, which is very much like her ambition. Blue has been accompanying her all the while but their relationship is nothing more than good friends. Btw, Blue has successfully become a lawyer. In one strange day, they stumbled across the Mainland girl (sorry, i 4got her name) who is partially responsible for Ah Hao's death. Little did they know that she's the one who eventually avenge Ah Hao's death. That's all for the story. Edited by HongYu, 21 August 2004 - 09:10 AM. Pls give me the title of the other song?? I also love it. ending song - Lydia by F.I.R. i love this series. i even bought a cd and a photobook of this series. some of the cast members guested on Happy Sunday just a few minutes ago. Dylan was so shy while he was being interviewed. Does the guy that plays Dan Zi (Lan Zheng Long) have an English name? I really like his character in this series...so shy! Would anyone know where I could download clips from this series? It doesn't have to be the whole episode. Little extracts are just fine. THE OUTSIDERS GALLERY. you are all welcome to upload screencaps & other stills there. my only request is that you upload a picture at least 200x200 pixels. thanks. Edited by francesca, 14 September 2004 - 03:23 PM. I love the beginning and ending part of the series. The rebellious school days, how Dylan woo the chick and of course the tragic ending. The middle part of the story is a bit dull tho..
nwey, they are part of the gangster now and stated to kill some people... the scene is really disheartening... why the story turned out to be like that... i mean... its very mean...there are "killing" involve in they story.. i thought its more like MG.. ... i hope its more on a love story.